Containing mainly poems and treatises on verse, this manuscript is known to have belonged to the monastery of St Augustine, Canterbury, in the middle ages because of an inscription on one of its pages. Most of its pages were copied in the 9th century, almost certainly in France, but a short section in it was copied in England during the 10th and 11th centuries. The poems for the most part are religious, and the monks of St Augustine would have read the manuscript as part of their personal devotion. Those who wrote verse may have studied and imitated some of the works in it. 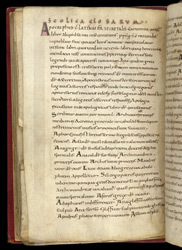 From the section of pages copied in the 10th century in England, this page has the beginning of an alphabetical glossary or brief dictionary of words chiefly of Greek origin. It would not have been compiled at Canterbury but would have been copied from another manuscript. The dignified, clear handwriting style is based on a Carolingian style of handwriting.